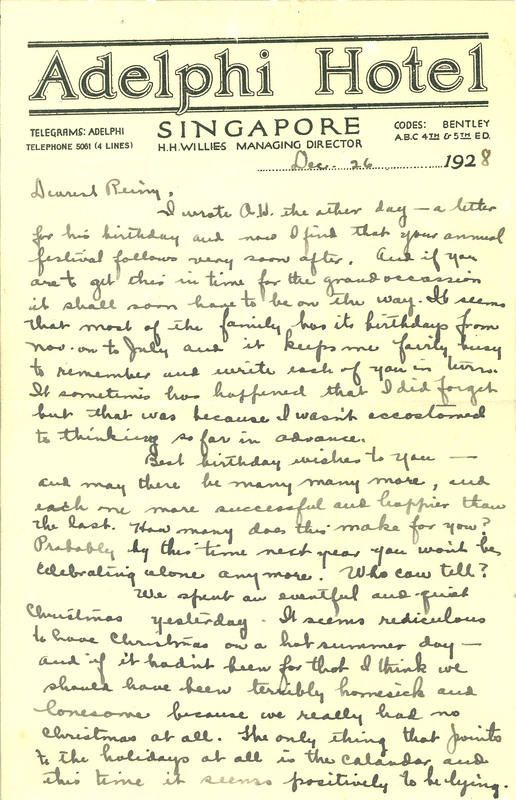 Dec. 26 1928 Dearest [Reiny? ], I wrote A.W. the other day - a letter for his birthday and now I find that your annual festival follows very soon after. And if you are to get this in time for the grand occassion it shall soon have to be on the way. It seems that most of the family has its birthdays from Nov. on to July and it keeps me fairly busy to remember and write each of you in turns. It sometimes has happened that I did forget but this was because I wasn't accostomed to thinking so far in advance. But birthday wishes to you - and may there be many many more, and each one more successful and happier than the last. How many does this make for you? Probably by this time next year you won't be celebrating alone any more. Who can tell? We spent an eventful and quiet Christmas yesterday. It seems ridiculous to have Christmas on a hot summer day - and if it hadn't been for that I think we should have been terribly homesick and lonesome because we really had no Christmas at all. The only thing that points to the holidays at all is the calandar and this time it seems positively to be lying.